The Giraglia Rolex Cup continues in Saint-Tropez, France through the 18th of June. The race has been a favorite of sailing fans since 1953 in order to establish a Mediterranean-based offshore race and encourage Franco-Italian camaraderie at the end of World War II. Rolex sought to be a part of the event in an effort to reveal the power of sport to bring the world together. The Rolex Yachtmaster has also played an important role in helping sailors keep precise time while navigating the waters. Without a doubt, the most exciting part of the event was the 242-nautical mile offshore race between Saint-Tropez and San Remo on June 12th. There were 170 boats participated in an effort to reach Genoa, Italy. Many sailors and sailing enthusiasts alike have been seen sporting the Rolex Yachtmaster and Rolex Sea Dweller as they enjoyed the adventurous event. A Rolex Yacht-Master is perfect for this occasion. One of the most challenging aspects of the Rolex Giraglia Cup is for crews to navigate around the Giraglia rock, which is one-nautical-mile north of Corsica. This portion was preceded by two days of racing in Saint-Tropez. The Giraglia Rolex Cup is a difficult challenge. For more than 150 years, Saint-Tropez has welcomed sailing events and recreational sailors from around the world. Also, the town has an affinity for luxury brands such as Rolex with its Rolex Sea Dweller, Rolex Explorer, and Rolex Yachtmaster models. 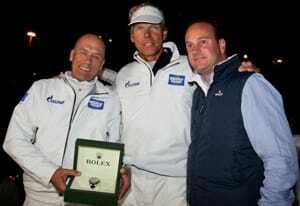 The Rolex Company’s involvement in the race and helped to spread the popularity of sailing competitions. During the event’s third day (June 10th), competitors were challenged with intense waters and northeasterly winds of more than 30 knots. Because of the weather, several boats were faced to bow out of the competition. The Swan 60 utilized a smaller sail than did others as its team vowed to finish at the top of Class 0 IRC. The Giraglia Rolex Cup is expected to continue to be a trill for all involved through June 18th. For more information, Google the event and there are certain to be some great stories and videos. Beyond the Giraglia Rolex Cup, Rolex is involved in several yachting events in the coming days and months. Definitely keep an eye out for sailing champion Robert Scheidt who has won more than 125 sailing titles. Scheidt is sponsored by Rolex and wears the Rolex Yachtmaster II as he adventures through his career and private life. Stay tuned for more Rolex yachting news!